How to Make Money with Amara Raja Batteries? We are highly optimistic on the growth prospects of Amara Raja Batteries as this stock has the potential to provide stupendous returns if held for short term. How to Trade Amara Raja Batteries? Amara Raja Batteries Limited has broken past the channel which was till now showing a downtrend trend and this break means that stock can now head for 300-322 level. The stock is overall assessed as technically positive for the short term. Enter in the stock and shift the stop loss first to 290 and thereafter shift to 300 levels once stock crosses above this mark. You can check our delivery stock tips here. 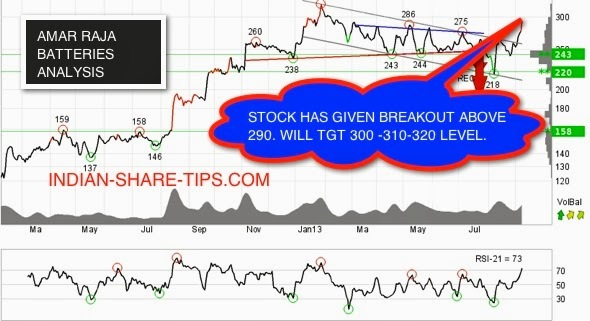 The post is made on 10 Sep 13 and our clients are long in the stock above 290 level.